After about ten days with temps in the 70's, lows in the 50's we just had two days of 28L, 56H. The peas have only been up for a tad over a week so still tender. I know peas can hold up to cold weather but to be sure I covered them with leaves. 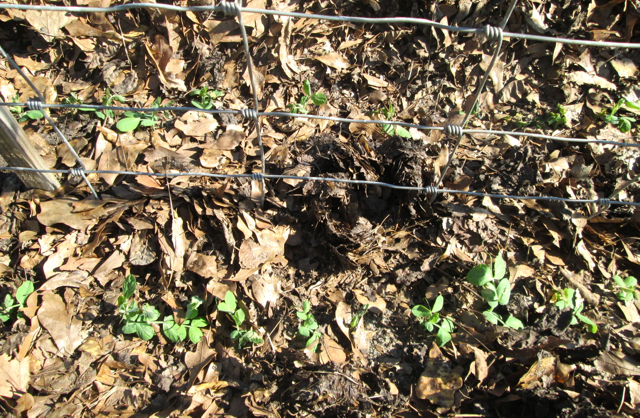 After the leaves were gently brushed off, the peas look no worse for the wear. Even the few who had popped up above the leaves and had that dark green greasy "I got toasted" look are ok. And now I don't have to mulch them later. A good thing! Excellent! I had purple snow peas with dinner... could eat peas and beans every day. I saw the purple snow peas in one of your posted pics. I didn't know there were purple. What is the variety called? With warmer temps on the way, I planted another 100 feet of Super Sugar Snap peas today. My peas are growing tendrils. I think they are Early Alaska. They grow about 3ft tall. My peas are just flowering. Not all of them yet. I have just one row of about 15ft. Thats enough for fresh eating / cooking with. I planted them around early Feb. So that is about 2 m9nths ago. Best wishes! I'm thinking mine will be done soon. High temps on the way. Started a new batch. I have hopes, but they are not high. Last edited by Shrinkrap; 1 Week Ago at 12:27 AM. If they're Early Alaska (~67 days), that's about right for flowering. My Wandos (~70 days) were planted Feb 15 but suffered a few frost setbacks. They just sat there a while recovering but all of a sudden have taken hold and are looking good. Off and running!